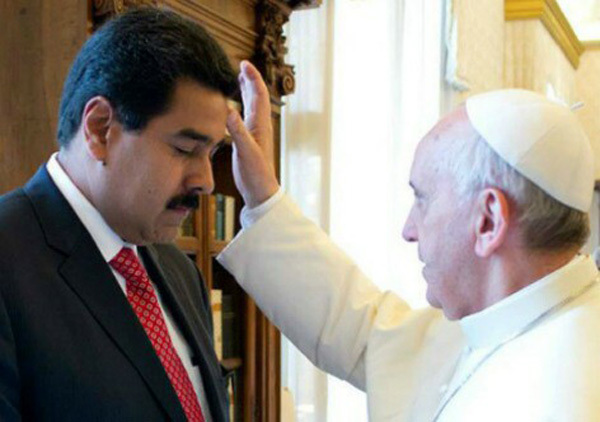 As the people of Venezuela together with its Legislative Branch suffer under the tyrannical oppression of president Nicolas Maduro, Pope Francis received him at the Vatican and allowed himself to be photographed blessing the dictator, above. The political situation of the country is critical, with the people and Congress calling for a referendum to depose their communist government. Maduro disregards any appearance of democracy and brutally imprisons his political opposers and beats the people in the streets, below. Since the government is presently facing widespread international disapproval, on October 24, 2016, Maduro ran to Francis looking for political support. And he received it. Obviously, Bergoglio spoke a few ambiguous words encouraging the "building of trust between the parties." Words, however, that hardly mask the scandalous support he gave to the communist despot. He also invited the parties "to show courage in pursuing the path of sincere and constructive dialogue to alleviate the suffering of the people." These words are hypocritical because everyone knows that Maduro is closed to any authentic dialogue and only wants to continue his unpopular Bolivarian Socialism, which is an euphemism for Communism. Now, it is curious to see that, on one hand, Francis gave de facto political support to the communist dictator against the interests of the people of Venezuela. Above all, he offered his ideological assistance to Maduro. On the other hand, he does not lose one single opportunity to attack "ideology" when it means the defense of private property, free enterprise and Capitalism. Facing this contradiction, we ask: Is Francis not also a communist? Below first row, the Venezuelan police imprisoning opposition leader Leopoldo Lopez who was demonstrating against Nicolas Maduro; second and third rows, examples of how the government understands "sincere and constructive dialogue" with the opposition; last row, youth display the bullets the Maduro's police shot against them, causing the death of many.